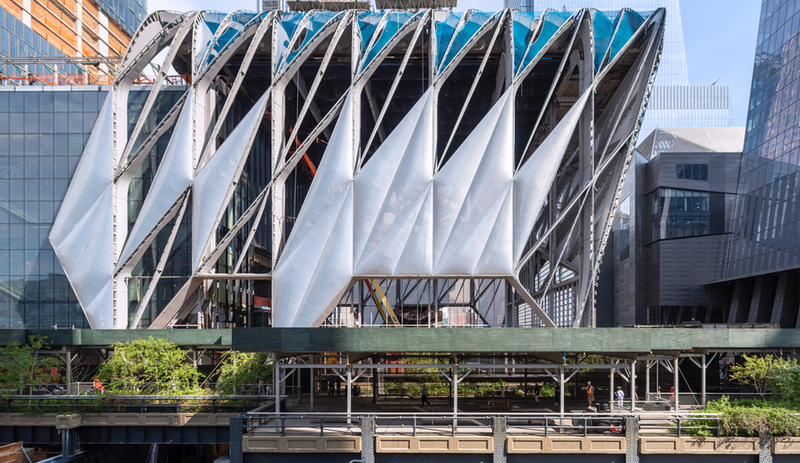 Thanks to a conspicuous site (it’s nestled against the High Line) and an innovative scheme (it has the ability to expand and contract), the Shed by Diller Scofidio + Renfro is one of the most anticipated buildings of the year – even the decade. 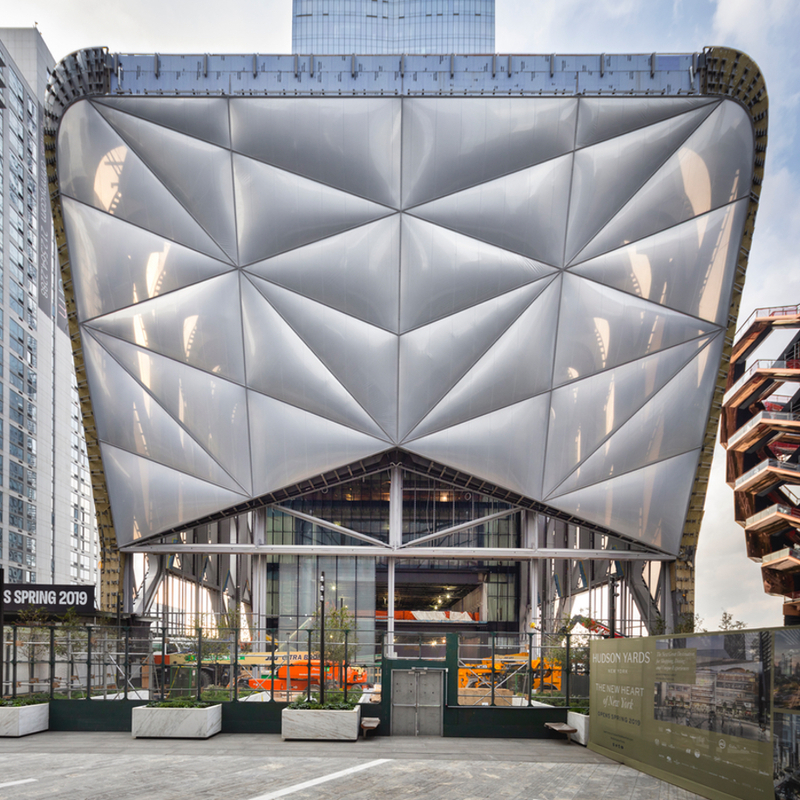 Designed in collaboration with the Rockwell Group, Lead Architect, and Collaborating Architect, the 18,580-square-metre art centre already appears to burst out of 15 Hudson Yards, a 70-storey residential tower, in its contracted state. The effect is enhanced tenfold when the building’s kinetic system is activated. It rolls the structure’s bubbling ETFE shell onto the neighbouring plaza, forming a covered, climate-controlled extension of 1,600 square metres. The added space accommodates performances with audiences up to 2,700 and can be merged with the outdoor space by opening massive doors to engage with the public areas to the east and north. The ETFE panels were recently installed and the building is set to open this spring. 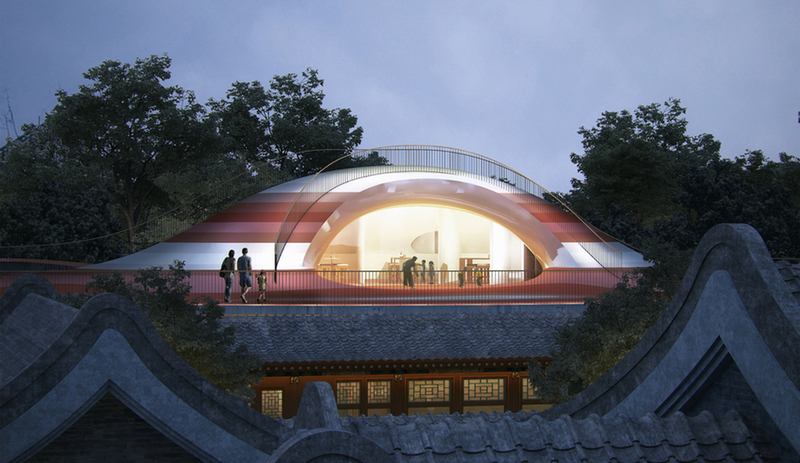 In the Courtyard Kindergarten in Beijing, MAD Architects has elevated the fifth façade to first-class status with a vibrant, hilly roofscape that floats above a Chinese courtyard dating back to the 18th century. 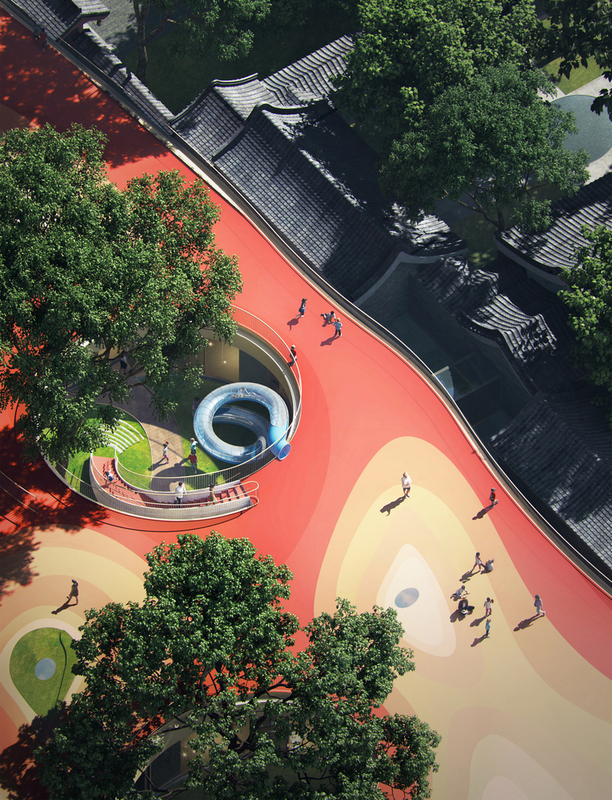 Inspired by a Chinese proverb – “There is a saying in old Beijing when children are naughty: if you go three days without being punished, the roof will cave in,” says MAD’s Ma Yansong – the meandering sports and activities playground encourages the school’s 400 children to take in the dynamic context of their variegated surroundings. Featuring cut-outs that allow ancient trees to burst through and that provide connections – via tube slide or staircase – to the spaces below, the landscape floats above an open-concept kindergarten that features a teaching space, library, small theatre, and gymnasium. Even here, at ground level, children get views of old and new through generous glazing. 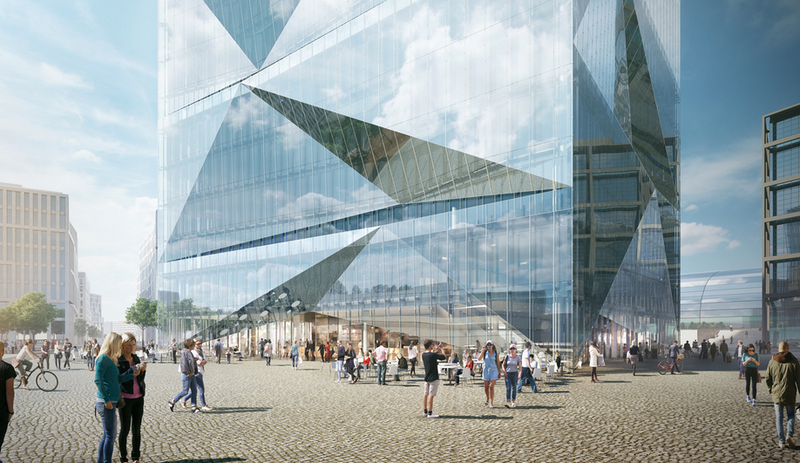 Rising from the centre of one of the German capital’s most prominent public squares, CUBE Berlin by Copenhagen-based 3XN is already a statement in the making. As its name implies, the building is a perfect cube, but its familiar geometry is given a certain complexity thanks to a layered glass facade, defined by pleated formations that lift tent-like to reveal openings and platforms on all four sides and on multiple levels. Distributed both horizontally and vertically, these apertures give each side a unique and dynamic face – an individuality furthered by a relief-pattern in the mirrored surface that distorts the surroundings as it reflects them. 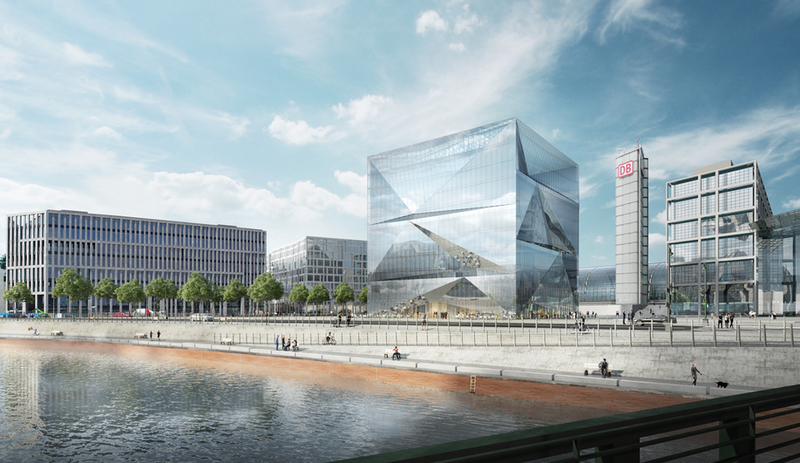 But promising to be more than just a beautiful and sculptural contribution to Berlin’s urban landscape, CUBE has been tagged “one of the smartest buildings in Europe” thanks to a complete integration of IoT ideals. Designed to enable and enhance interaction and address the needs of a 21st-century workforce, the building will feature a “self-learning brain” that will coordinate individual systems such as access, climate and lighting control, so that users can identify their optimal working environment. Taking shape in Toronto’s Fashion District, 51 Camden is a hospitality project cut from a different cloth. In fact, it boasts a façade that feels more textured than most new developments in the downtown. 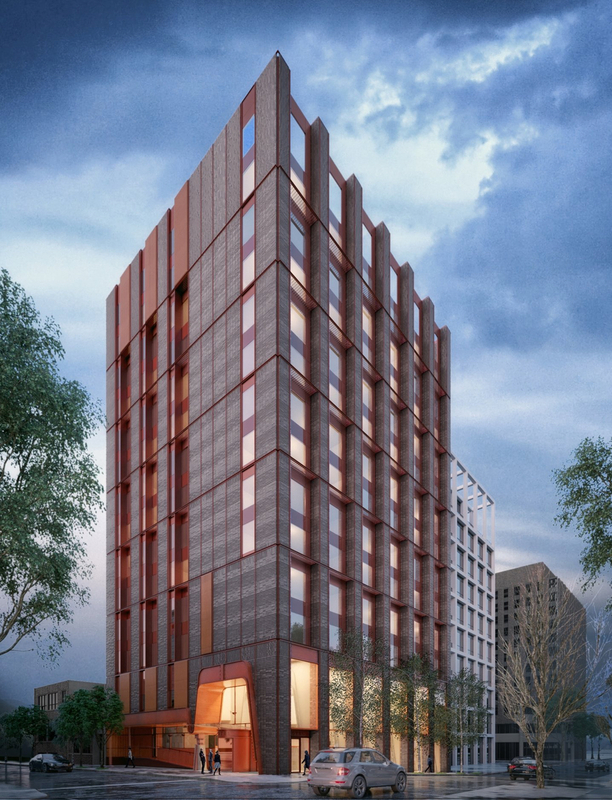 That’s because the 13-storey, 130-unit brick and weathering steel building is by Shim Sutcliffe, the renowned Toronto architecture firm known for its attention to craft and detail. Which explains its swooped entrance, like a lifted veil that welcomes visitors in, and its massive exposed concrete columns. 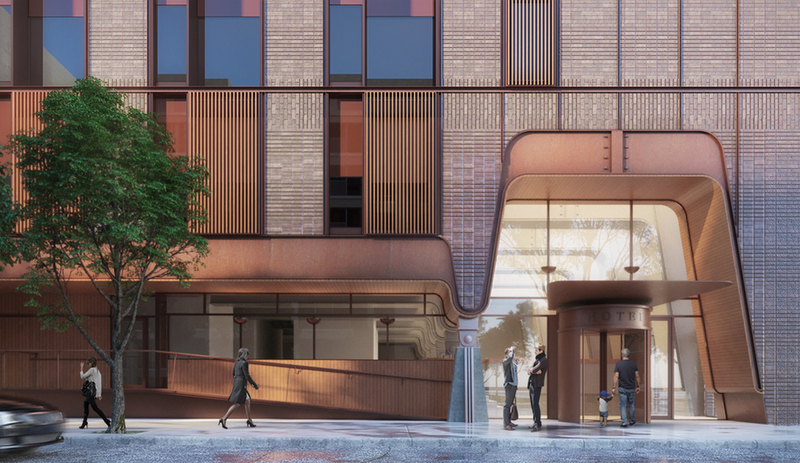 The project, long rumoured to be the future home of Toronto’s first Ace Hotel, is by Carbon Hospitality – the new arm of Kenneth Zuckerman’s quality architecture-driven Zinc Developments. And while we’ve been watching it for a while now – and it’s still somewhat shrouded in mystery (in an age of digital modeling, there are only a few very painterly renderings available) – the project is slated to be competed in 2019. In 2017, we named Ateliers Jean Nouvel’s latticed Louvre Abu Dhabi one of the year’s best projects. 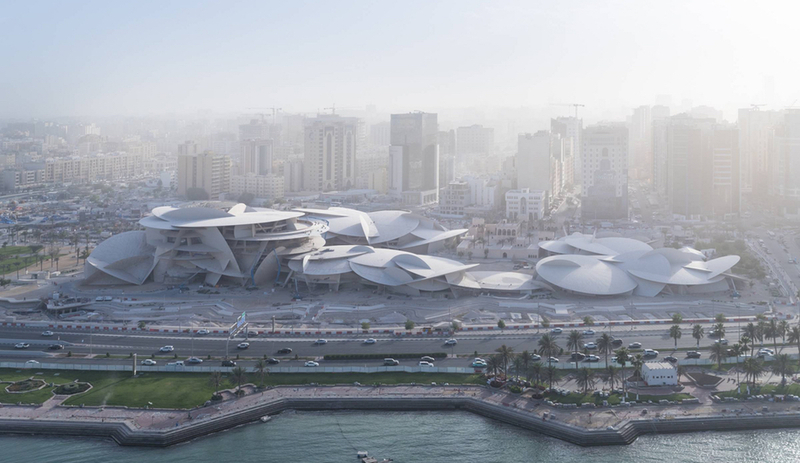 Two years on, the French studio has another highly anticipated Middle East cultural project nearing completion: the National Museum of Qatar. 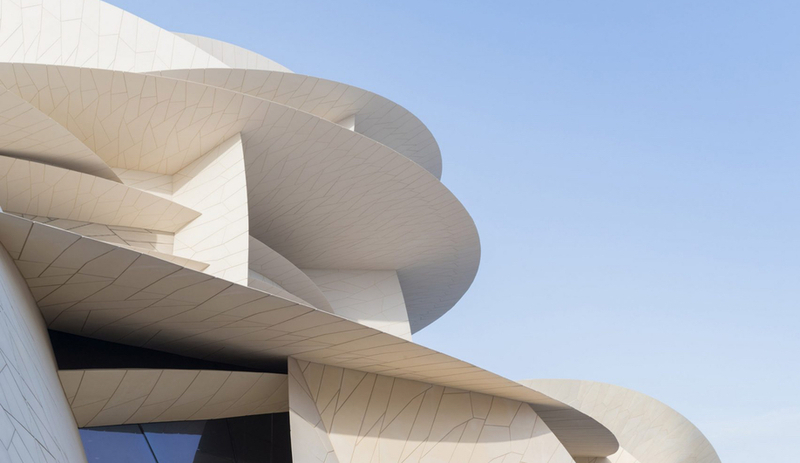 Set to open this March in starchitect-friendly Doha, the 41,800-square-metre gallery is built around the former home of Qatar’s royal family, and accordingly, Nouvel is promising an architectural marvel that tells the story of the nation itself. No small feat. Aerial photos of the gallery reveal a picture-perfect execution of Nouvel’s renderings, released in 2010. With 11 intersecting galleries and 114 fountains – whose streams were inspired by Arabic calligraphy – the gallery aims to hold relics, curiosities and art that celebrates the region’s 700 million-year-old history. But while its interiors promise to be ambitious (or perhaps even ostentatious), the museum’s most talked-about feature has humble inspirations: its roofline, made from a series of interlocking and cantilevered discs, is a faithful recreation of the delicate petals of a desert rose. It’s a reminder that, amidst the glass towers and sparkling water of Doha, this modern metropolis was a tiny desert town only 50 years ago. To the future. Thomas Heatherwick’s Vessel in New York has some major competition: The Camp Adventure Tower, by Effekt, is also a spiralling and climbable structure that packs in a lot of wow factor. 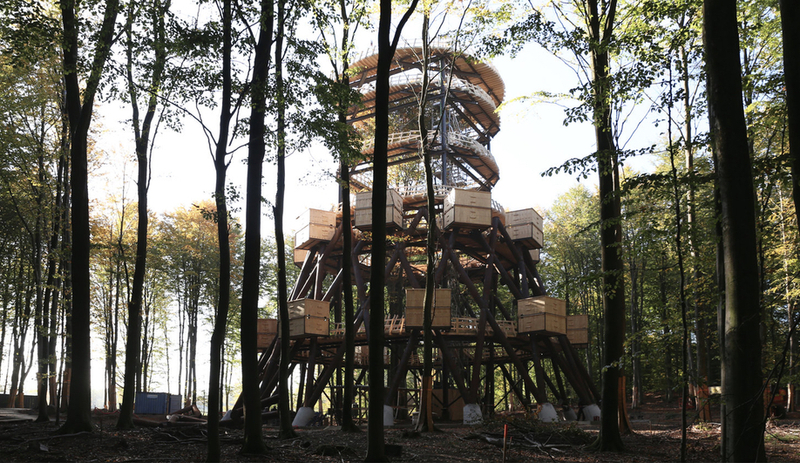 Located in Camp Adventure Park, in a preserved forest one hour south of Copenhagen called Gisselfeld Klosters Stove, the tower celebrated its topping off ceremony in December, which means that soon visitors to the park will be able to climb the hourglass-shaped folly to reach an observation deck 45 metres above ground. With a seamless and accessible ramp made of local wood and a steel lattice structure forged in Corten steel, the tower nestles into its natural setting. 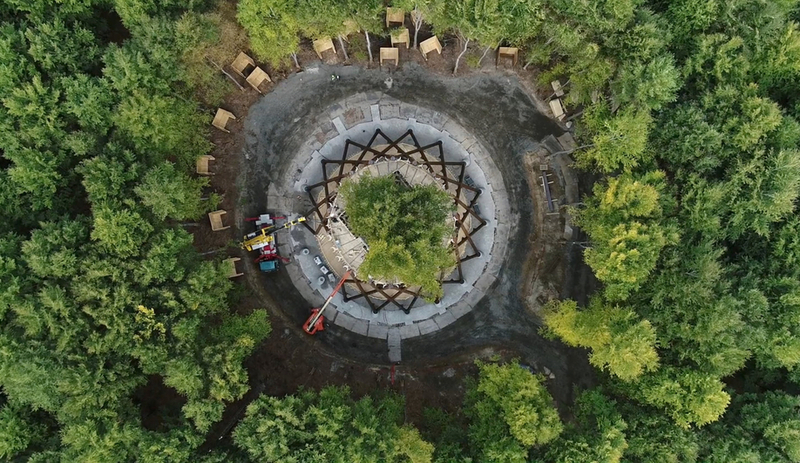 The team chose a site that would allow them to preserve as many trees as possible; the architects, in fact, are known for the visionary sustainability of their projects, which include plans for the Regen Villages mixed-use community. Connected to the tower is a treetop walk, some 900 metres of promenade split into two levels: the high walkway passes through the oldest parts of the forest and the lower through the newest. 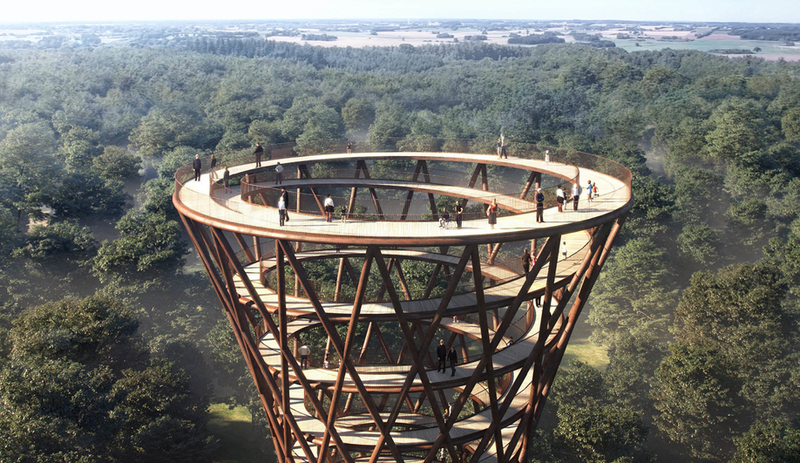 Though the structure’s shapeliness, engineered by Arup, feels instantly iconic, it was chosen for pragmatic reasons: it increases stability and allows the observation deck to be bigger and better immersed in the forest. Camp Adventure expects visitor numbers to swell dramatically once the tower is complete – from 18,000 to 100,000 – and we expect the same. 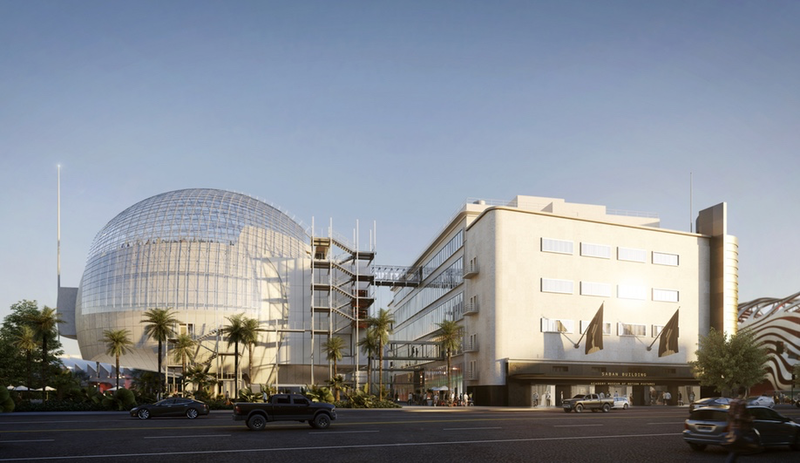 And the award for the most hotly anticipated movie museum in North America and perhaps the world goes to … the Academy Museum of Motion Pictures, designed by Renzo Piano Building Workshop across 27,870 square metres at the intersection of Fairfax Avenue and Wilshire Boulevard in central Los Angeles. Devoted to exploring the art and science of movies and moviemaking, the facility will actually be more than just a repository for the Academy’s vast collection of film artefacts, which are admittedly pretty cool (think Dorothy’s ruby slippers from The Wizard Oz and the last existing shark model used in Jaws). 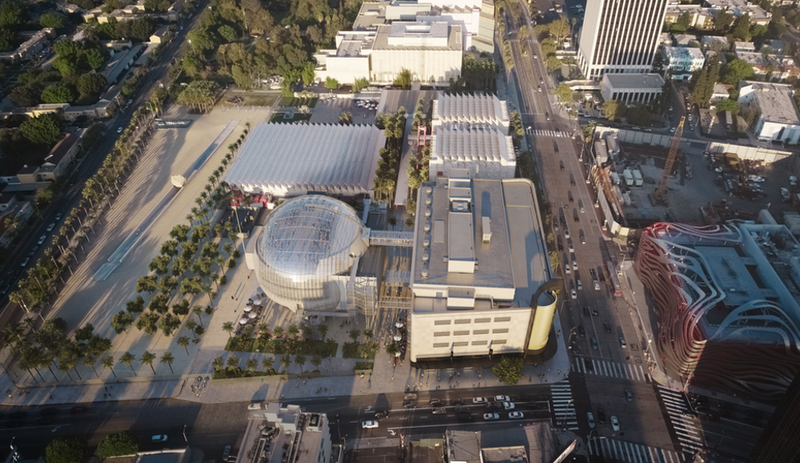 Involving a major expansion of and addition to a historic former department store in the Streamline Moderne style, RPBW’s dynamic design includes an education studio, two state-of-the-art theatres and inviting new public spaces as well as 4,645 square metres of immersive gallery space. An undisputed highlight is the soaring new spherical addition boasting a rooftop terrace with views of the Hollywood Hills. 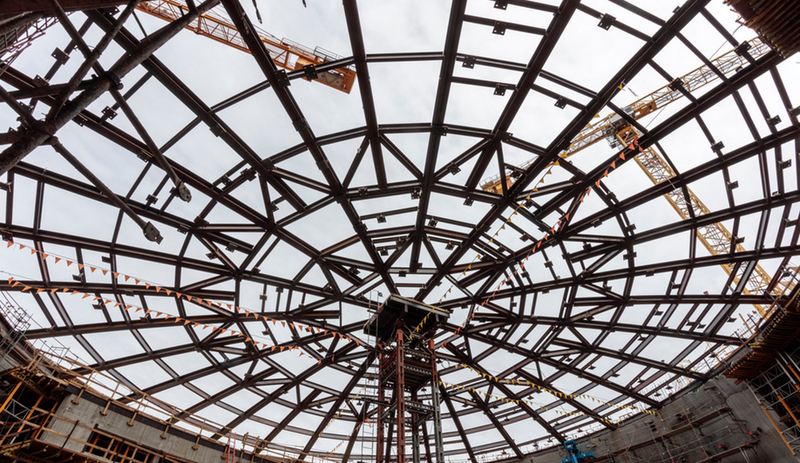 Made of steel and reinforced concrete, the dome is studded with specialty glass fabricated in Austria. Like the latest Hollywood acting sensation, it seems fated to become a star in its own right. The museum is slated to open late in 2019. 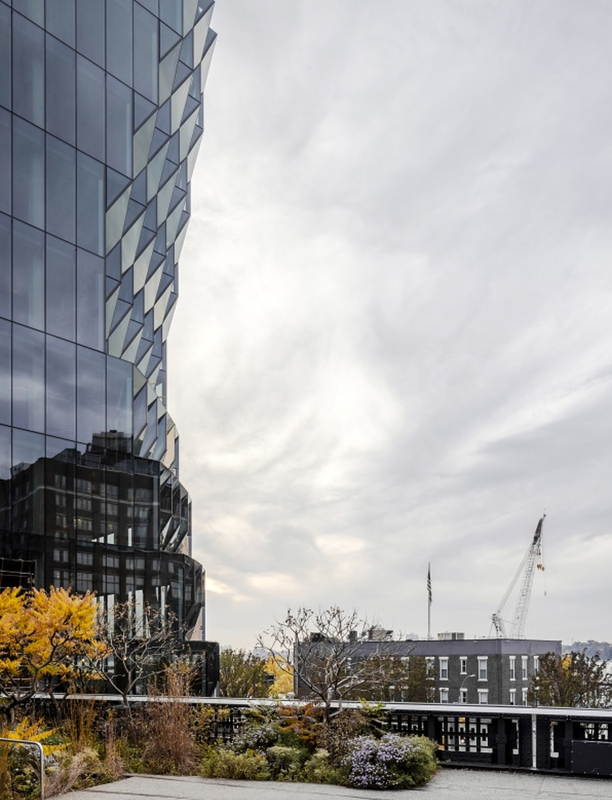 While its prominent location along New York’s High Line – which will witness plenty of changes in 2019 – means 40 Tenth Avenue will be hard to miss, its outward design ensures that all that attention is warranted. The work of Chicago-based Studio Gang, the 12-storey office building is defined by its stunning gem-like facade, a result of the firm’s ongoing research into how tall towers can (and should) engage with and contribute positively to their surroundings. 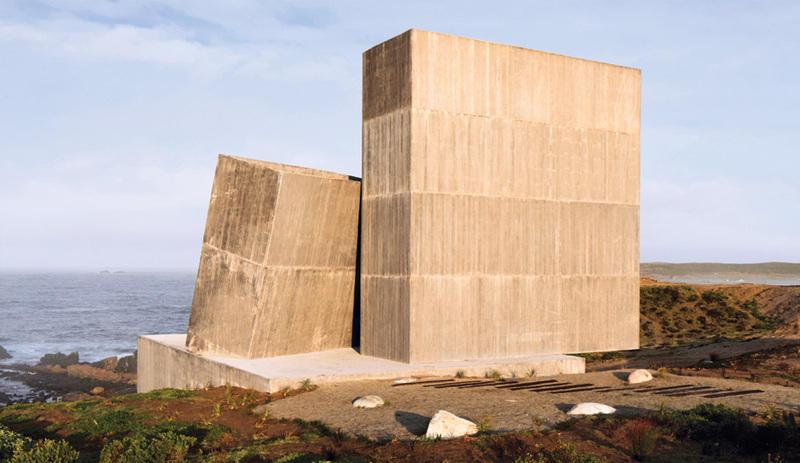 Exemplifying what the studio terms “solar carving,” the faceted exterior was sculpted as a considered response to the trajectory of the sun as it rises and sets. 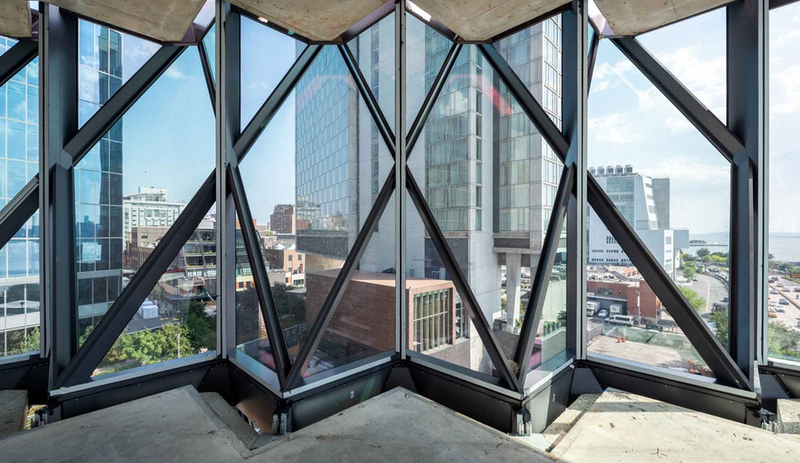 Made from a dozen different types of low-reflective glass, the glazing is comprised of a series of facets built around a central, downward-tilted diamond-shaped panel that is surrounded by four triangular pieces. 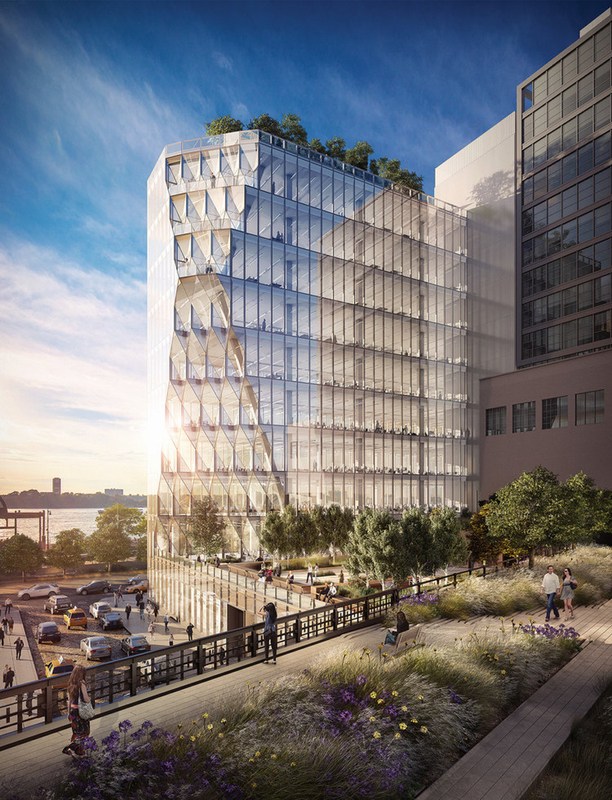 The three-dimensional designs “carve out” one side of the building’s envelope, blocking sun glare and heat gain, eliminating shadows and pulling more sunlight into public spaces. Set to open in the spring, 40 Tenth Avenue introduces a new personality to the other architectural wonders along the elevated park by such heavyweights as BIG, Zaha Hadid, Renzo Piano and Frank Gehry. First, Zaha Hadid Architects abandoned the project. 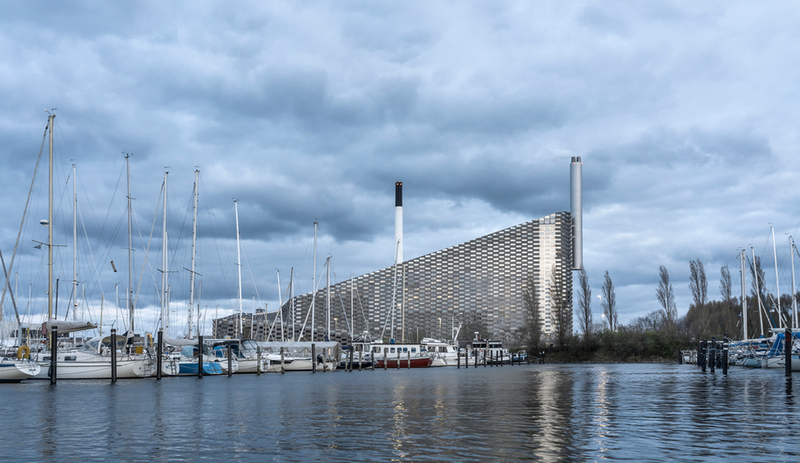 Then, Kengo Kuma picked it up – only to be accused of plagiarism and using unethically sourced wood in its construction. 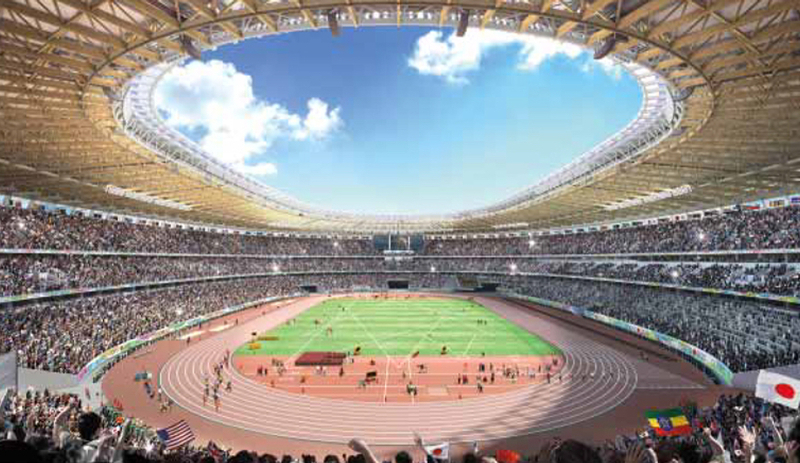 But this year, the saga of the $1.5 billion Tokyo 2020 National Olympic Stadium will hopefully end, with an expected completion date in late 2019. 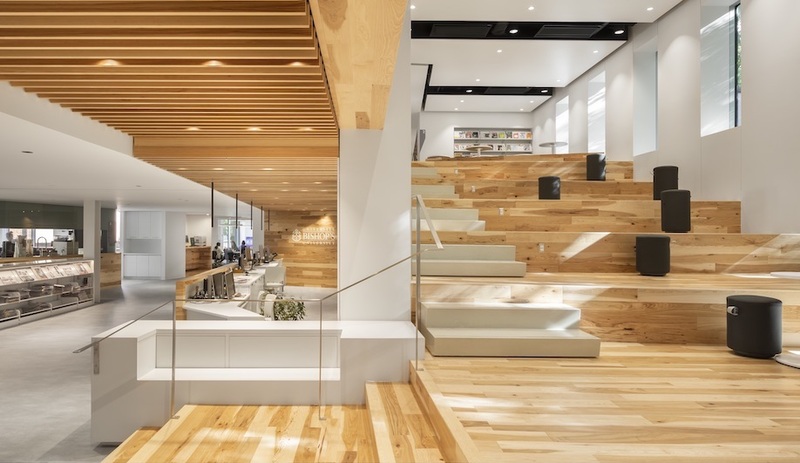 Despite the many controversies surrounding the project, the Japanese architect seems downright excited about the project: last year, he collaborated with AirBNB to provide a sneak peek of the building, and in an interview with Azure, Kuma detailed his goal of creating a “kind of spiritual stadium,” one that straddles the line between nature and the built environment. In practise, the 68,000-seat venue – largely constructed from cedar – is a temple-inspired stadium, ringed by trees and topped with a dramatic oculus. Kuma says he was able to create the stadium’s curvy geometry using 3D modelling techniques he developed while designing Scotland’s acclaimed V&A Dundee, which places a playing field under dramatic arches of timber latticework. 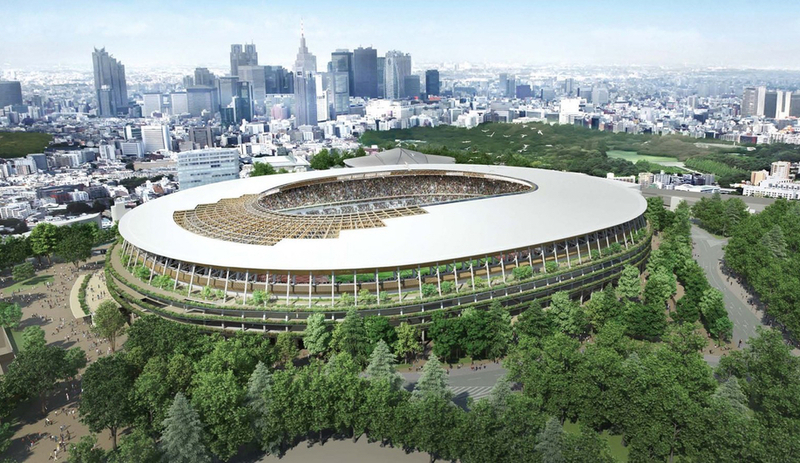 It promises to be one of Tokyo’s biggest statements at the 2020 Olympic Games – and a major advancement in wood construction. Fancy a slalom down the side of a power station? 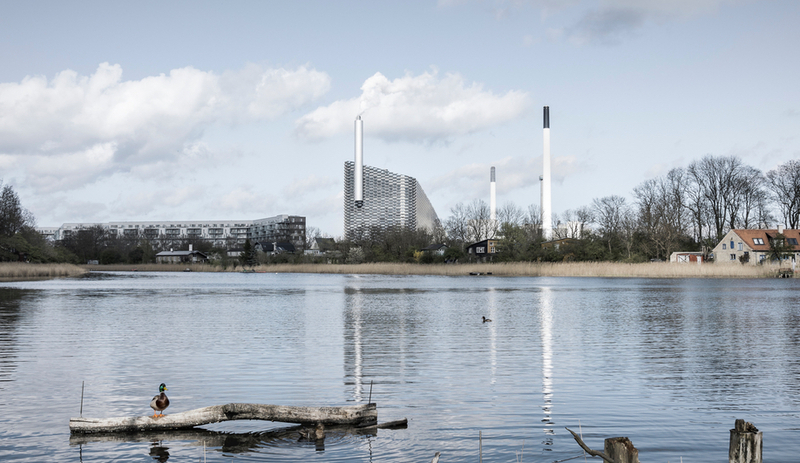 Head to Copenhagen, where the unique recreational grounds covering BIG’s Amager Bakke Waste-to-Energy Plant will soon be welcoming fitness buffs. In addition to a 600-metre-long ski slope, the park stretching down the side of the plant, which juts 88 metres into the air and features a beacon-like chimney that blows a smoke ring for every ton of carbon dioxide burned, also features hiking trails, climbing walls and numerous viewing platforms. According to Rasmus Astrup of SLA Architects, which designed the 16,000-square-metre green space, creating a natural environment atop a manmade structure proved “very challenging,” but was pulled off after putting a variety of plants and trees through a battery of resiliency tests and designing a landscape that encourages regeneration. “The rooftop’s nature,” Astrup explains, “is designed to attract and shelter a wide selection of birds, bees, butterflies and insects, which in itself will mean a dramatic increase in the biodiversity of the area.” Amager Bakke, in other words, is destined to become a magnet for humans and non-humans alike, making it a bio-model for cities worldwide.